The game of football is older than we think. The primitive form of the game dates back to close to 400 years before Christ. Yes! That is astonishing to know that the sport the world is mad about is not just a couple of centuries old but ages more than two millenniums. With the passage of time the game evolved and came to be known as football in its most modern form. 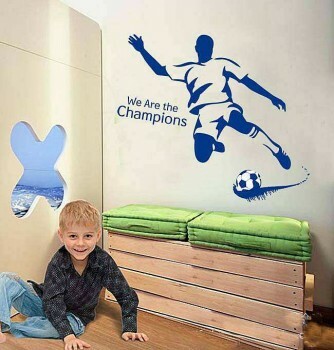 Now you could give a permanent place apart from your heart to your favourite sport- football with these amazing football wall decals. 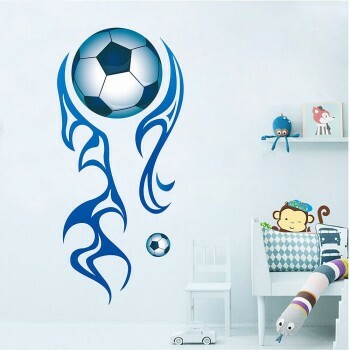 With a cool blue colour, this wall decal gives a heavenly look. There are 2 footballs; one that makes your love for the game evident with a blue fire trail and another a tiny one which probably could motivate your kid to aspire the game. The best thing about this decal is you can place it horizontally as well, for that matter you can place it in any direction. This wall sticker is a dual chromatic sticker which takes the second colour from your wall. 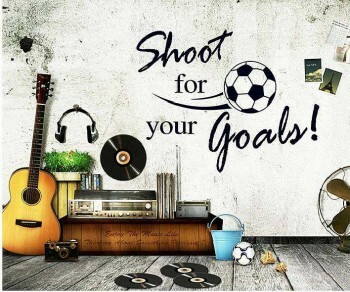 What makes it more inspiring is the tagline it has- ‘Shoot for your goals!’. The quote would surely kick in to start pursuing football if you are a lazy lad. The black pentagonal groves of the football give you a genuine look. Want to depict your love for the game with some action? Try this wall decal. 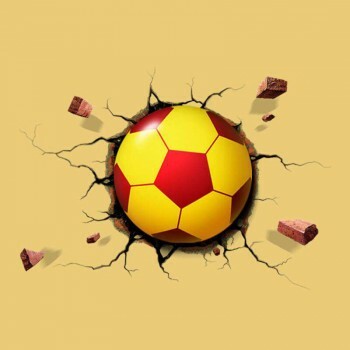 A huge football smashed into the wall, creating clefts on all the sides and a couple of bricks flying out, it gives a very real visual of a damage. The red and yellow football would stand out on a light background wall. This is going to be the most awesome football sticker for our room. A dual chromatic blue coloured decal (with other colour of the wall background) this just makes it more amazing. A player springing his left leg toward a football with a quote on the other side which says- ‘we are the champions’ will make your day.